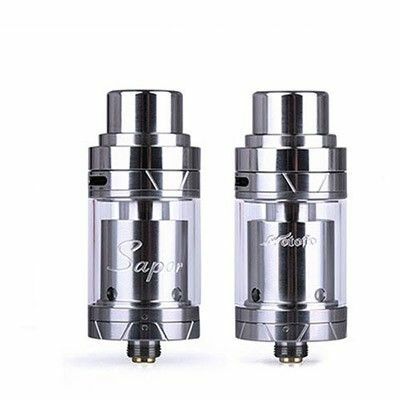 The Wotofo Sapor RDA tank is an original, affordable top airflow rebuildable dripping atomizer that features a deep 6mm juice well, a split positive post, fully adjustable dual top airflow, and a clean elegant look. 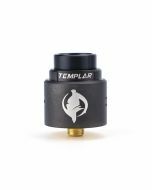 The Sapor RDA features a redirected dual top airflow style, with each airflow slot measuring an ample 12mm by 2mm, allowing for tremendous airflow while fully open. This can also be throttled down for flavor and heat adjustments, while the unique airflow path allows for a high amount of swirl and turbulence across the chamber. The deck features a split positive post anchored with a square PEEK insulator, minimizing post turning. Deckmilled squared negative posts ensure durability with each posthole measuring 2.5mm each to accommodate a wide variety of coil configurations. 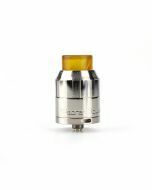 Each Sapor also features a hidden 510 Adapter that can used with the included PEEK Shorty Widebore Friction Fit Drip Tip or removed entirely and replaced with the included Wotofo 11mm Broadcap. 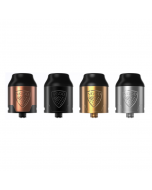 Manufactured out of high grade Stainless Steel and German Made PEEK Insulators, the Sapor RDA by Wotofo is a fully featured top airflow system with enormous value. Coilart Dpro RDA Review-- Great Concern on Flavor!